Even as the City of Cape Town announced it was preparing for winter rain, the heavy rain experienced on Sunday resulted in over a thousand Khayelitsha residents having their homes waterlogged. According to the City’s figures, 1 320 people had their homes in Khayelitsha’s Endlovini informal settlement flooded. City disaster risk management spokesperson Wilfred Solomons-Johannes said homes were flooded due to residents illegally erecting structures in low-lying areas prone to flooding. He said during the winter season the high-water table rose and water pooled in low-lying areas. Residents in Endlovini were assisted with blankets and meal,” said Solomons-Johannes. Affected resident Langa Dlengane, said he didn’t sleep at all on Sunday as he was fighting to bail water out of his house. “The whole day Sunday I was busy taking water out of my house. I had to dig a hole in front of the shack in order for water not to go through,” said Dlengane. 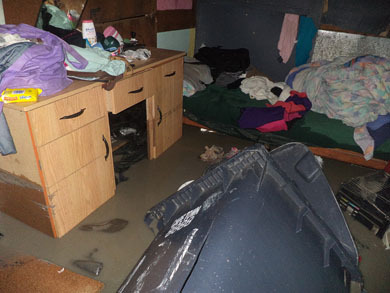 Resident Asiphe Kalako said all her belongs are wet, including her children’s school books. She said now that the rain has stopped she needs to take everything out of the shack in an attempt to dry it and she was worried that electrical appliances would no longer work. Teams were placed on high-alert and geared to assist residents in distress as more rains and storms were predicted this week. On Monday the city announced its Winter Plan for the 2013 season, detailing how relevant City departments will liaise to deal with possible flood damage and other eventualities during the winter rains. Nine high risk areas were identified. These included the informal settlements in Fisantekraal, Philippi, Gugulethu and Strand. All rescue and disaster assistance agencies would be on standby and early warning systems were put in place to ensure the City had as much time as possible to prevent disasters. Solomon-Johannes said the SA Weather Service predicted the rain will moderate as from Tuesday until Wednesday with light showers over the Cape Peninsula.